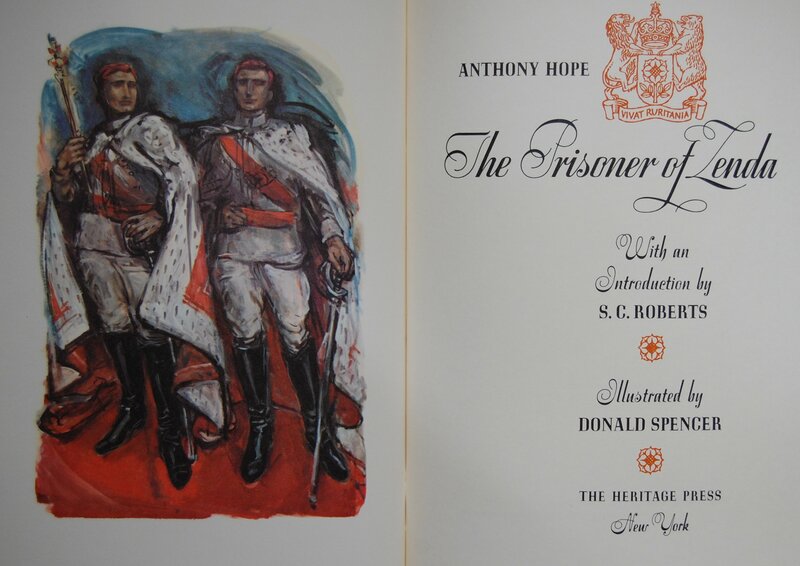 Antony Hope’s invention* of the cardboard kingdom in The Prisoner of Zenda is the subject of this week’s Really Like This Book podcast scripts catch-up. Hope was a respectable Victorian London lawyer, but he had a secret passion for the romantic and dramatic, and wrote many novels. 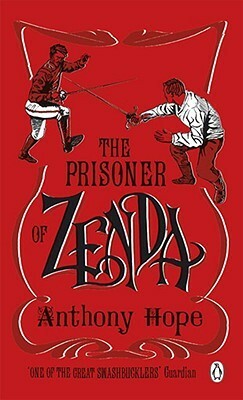 His most famous is The Prisoner of Zenda, from 1894, in which Rudolf Rassendyll, a flaming-haired English gentleman, travels to Ruritania for a holiday, and discovers that he is the spitting image of that nation’s king. This is not a great surprise, because Rudolf Rassendyll is also descended from the Ruritanian royal family, after a dangerous liaison between Rudolf V and his married grandmother, earlier in the century. But Rudolf arrives at the moment of a crisis. The king, also a Rudolf, is about to be crowned, but he has also just been kidnapped, by his wicked half-brother Black Michael, and if he does not ascend the throne at the appointed time, Michael will take it, and his fiancée, their cousin, the impossibly beautiful Princess Flavia, from him. Step in, replacement cousin Rudolf, and take the throne, take the princess, and take out Black Michael. Just temporarily, you understand, until the real Rudolf is found and rescued. But what if the replacement Rudolf and Princess Flavia fall in love? What if during the duels and sword-fights to rescue the king, the king accidentally gets spiked? What if the will of the Ruritanian people, who are very keen on their king marrying the princess, rushes the impersonator to the throne? Could an English gentleman ascend the throne of Ruritania? This delicate political point is the reason for the long, long popularity of this novel. 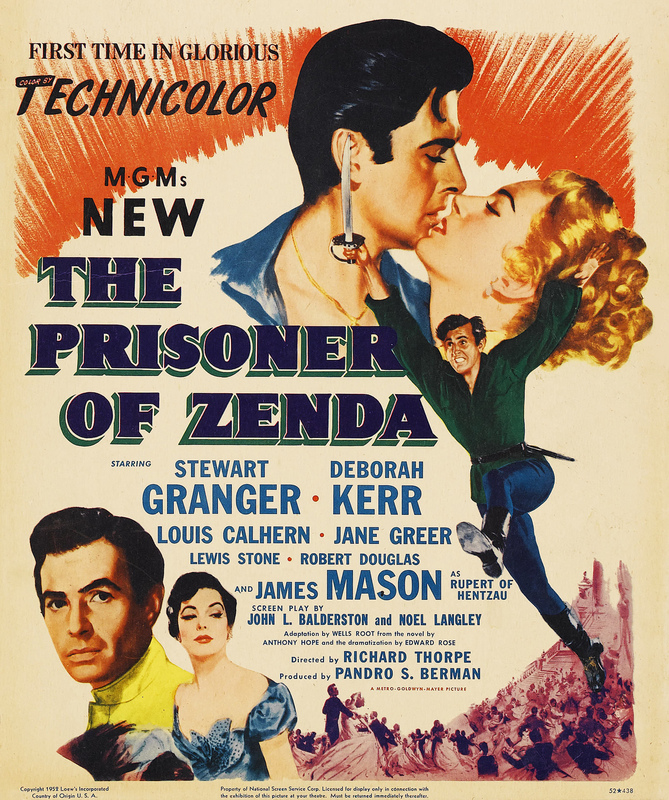 It is a terrific swashbuckler, full of action, and tense moments of physical drama. It is delightful to read so much dashing about on horseback and swimming across moats. The moments of passion between the English Rudolf and Flavia are believable because they’re so cinematic: we can reframe the Victorian melodrama into a nice period costume film. But they’re also believable because, at heart, every reader would like to think that they are as a good as a king, or princess, and could ascend a throne. And this is why Antony Hope invented what is now called the cardboard kingdom. It’s related to Arcadia, an invented country, a not-real place, to which the characters can go to have rollicking adventures in freedom, or retire from the world to sort out their problems. This is a very old literary trope. Shakespeare used it all the time, for instance in As You Like It. Hope developed the idea by making Arcadia a kingdom. It has to have a royal presence, and a throne to be fought over, and a dynasty to save. The whole point of the cardboard kingdom is that a gentleman outsider will arrive and sort out their problems. In the hands of Victorian English excursions to the cardboard kingdom, this was a way of affirming the superiority of the English, the world leaders at sorting out other nations’ problems. Hope’s Ruritania was the first of many similar fictional kingdoms, which is why the name of his cardboard kingdom has become the generic term for the concept. The kingdom also has to be located somewhere in middle Europe. In relation to Britain, it should not be as far east as Kazakhstan, but also not as close as Germany. The cardboard kingdom needs to be vaguely familiar: in the atlas, but not on a page we’ve looked at very often. That way, a gentleman traveller can be sure that the trains will run there (for there are always trains in Europe), and that he will be able to leave when he wants to, without consequences, to return to his own world. Sometimes the inhabitants of the cardboard kingdom come to Europe, and then go back into cardboard land. This happened with Elinor Glyn’s notorious and scandalous novel Three Weeks, in which a young English diplomat found himself having an affair with a glamorous foreign lady in her rented villa off Lake Geneva, only to find that she was the queen of a cardboard kingdom, and, later, that he had become a father. That’s the most interesting inversion of the idea that I’ve come across: most cardboard kingdom novels by Dornford Yates, or John Buchan, for example, just copy what Hope did, in different ways. What Hope did to make his novel so long-lasting, and so popular, was to distill the essence of romance and adventure into a very short novel. It won’t take you more than an evening to read. It begins at a late Victorian breakfast table. Rudolf’s sister-in-law is a slightly prissy Victorian lady, embarrassed at the very existence of an illegitimacy scandal in her husband’s family. But when Rudolf arrives in Ruritania, somehow he’s gone back a few more decades, to a way of life that feels more Napoleonic rather than Victorian. By the time that he and his accomplices are plotting their rescue of the king, and dealing with chamber maids and henchmen, their language has become positively Shakespearian. Time seems to slip in Ruritania, but a gentleman’s honour is timeless. The English Rudolf is the soul of honour, and this drives his conduct throughout the story. He will not betray or abandon the king by refusing to help him, or by allowing him to die in his prison, but, since the king has shown no interest in Princess Flavia, it’s perfectly fine for Rudolf to fall in love with her, and to woo her, to the great delight of the population. She, in turn, is pleased by his attentions, and finds that the new Rudolf is a much more attractive person than he had been before, until it’s too late and she is just as much in love with the new Rudolf as he with her. It’s an interesting point of behaviour, how not to betray your king by falling in love with his impersonator, but Flavia’s honour is strong: she will not renounce the king, and she will do her duty (probably through gritted teeth). However, every year, she sends the English Rudolf a red rose in a box, with the message ‘Rudolf – Flavia – always’. So romantic. 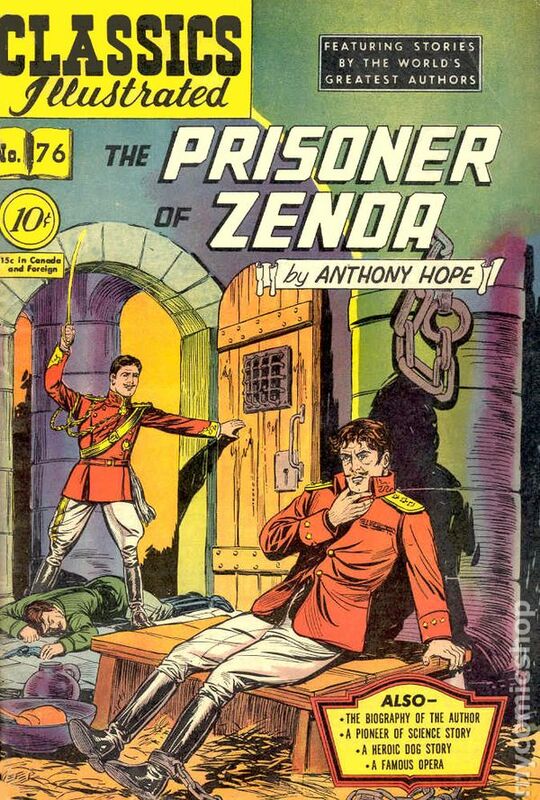 Also very, very transparent, because it’s the interception of this box that brings about the sequel to The Prisoner of Zenda, the even more dashing and magnificent Rupert of Hentzau. Peter Sellers in the Stewart Granger swashbuckling role? Rupert is the maverick in the otherwise perfectly ordered world of the Ruritanian deception. All the other Ruritanians seem not to notice the difference between Rudolf the king and the English Rudolf, which makes the set-up seem a little like a pantomime. But Rupert can see the marks of the English Rudolf’s shaved moustache and crown imperial beard, and the unaccountable difference in the king’s attitude towards Flavia after the coronation, and her blushes and generally infatuated demeanour which were simply not in evidence before. These, taken singly, might not add up to much. But Rupert also knows that the king is in prison, because he is one of the king’s noble guards, and potential murderers. So when he sees the English Rudolf play-acting as the king in Strelsau, he just laughs up his sleeve, and awaits developments with enjoyment. Rupert is fun. He is absolutely modern, utterly irreverent, has a wicked sense of timing, and is a terrific duellist. He and the English Rudolf battle with swords and revolvers, and both secretly swim across the same moat at midnight on the same night. They’re clearly the same kind of adventurous chap. But Rupert is amoral, not a bad chap exactly, but not at all the upright soul of honour that English Rudolf represents. It’s fine for a Ruritanian to have a flexible understanding of honour, but for an Englishman, this cannot be so. Rupert is Rudolf’s foil, his wicked alter ego, and he completes the enjoyment of this fine swashbuckling novel. * Hope didn’t invent the cardboard kingdom: Neil Harvey points out that Robert Louis Stevenson’s Prince Otto predates Zenda, and so does Meredith’s The Adventures of Harry Richmond. For more on the subject, see Raymond P Wallace, ‘Cardboard kingdoms’, San José Studies 13:2 (1987), 23-34. I’d beg to differ about Ruritania being the first cardboard kingdom. Have you read Robert Louis Stevenson’s Prince Otto? Written about 10 years earlier, it is blessed with Stevenson’s prose and that’s about all it’s blessed with. Prince Otto finds he is not as popular as he first thought and eventually leaves his kingdom. Lots of plotting but little derring do. However, the fictional kingdom of Grunewald does predate Ruritania and I can’t help but think that Hope was well aware of the novel, when he came to write his piece. You’re quite right: I should have written ‘popularised’, not ‘invented’, and will correct that. However, Prince Otto (which I hadn’t even heard of, must look for it) wasn’t the first. I did some research on the cardboard kingdom some years ago, and found an article by Raymond P Wallace which argues that George Meredith’s The Adventures of Harry Richmond (serialised 1870-71 in The Cornhill) was the first to invent a fantasy European country for adventuring in. It’s quite likely that RLS read that too, as well as Hope. That’s a 2013 book, for anyone wanting to investigate further.